Even on a short break from my restoration-issues I keep getting confronted with my love für die Neue Klasse. When driving from Palermo to Agrigento (Sicily) in my rental car a bunch of Italian classic car owners were driving the same route out of Palermo. They halted at a gasstation and I started talking to the owner of this lovely 1600ti. And started to take some pictures. The guys around him didn't really understand this as they owned Ferraris and Maseratis. 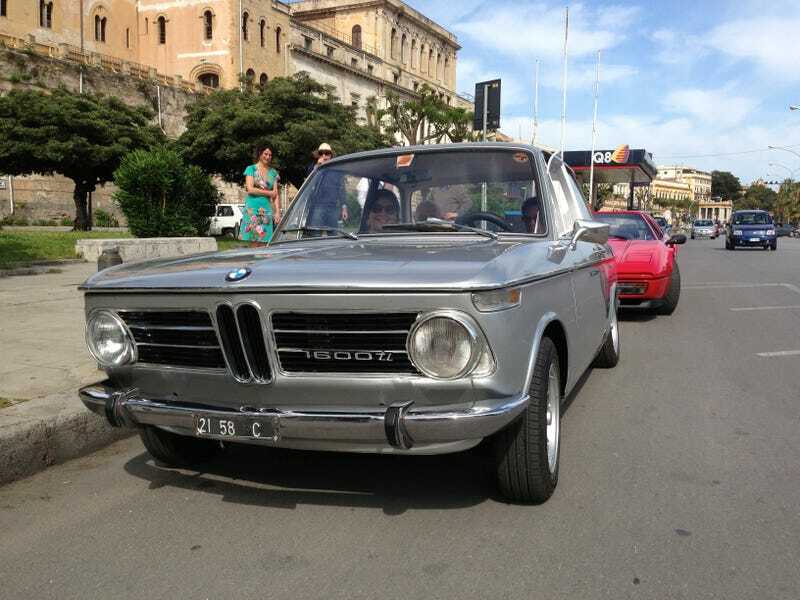 Nice guy (usually the Neu Klasse owners are of course), was really proud of his excellent 1600ti. Only looked as if he had mounted Fuchs 914 rims but hey: they looked period-correct. After this I got a slightly concerned Erik contact me by phone (my friend with the car-lift where my new 2002 touring body is at as we speak), he's not completely satisfied with the new body. But that I'll post and hopefully solve after my holiday. Arrivederci!